Give your cars a home and give yourself a workshop. We hope to expand this range in the future but our Australian Made triple garage from Cheap Sheds is a great way to not only protect your vehicles but also to create your own workshop. Available in many styles and colours, the triple garage is big enough to solve all of your storage problems. Whats MORE! We provide outstanding, award-winning customer service. 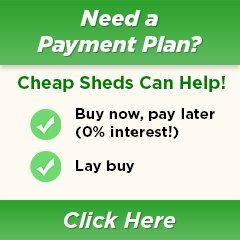 We provide you with support during your shopping experience, after your purchase and even LONG after your shed is assembled! We deliver Australia Wide and you can choose from Home Delivery or Depot Delivery>> More delivery details. Use our chat or call us to get in touch and we will help find you the best storage solution for your needs.